It's hard being a creative type. Sometimes I get inspired to write something or dance something or...cook something...and nobody else on the planet gets it. I am shunned. Ostracized. I get funny looks from my peers and puzzled, "we still love you Mommy" glances from my progeny. I persevere. Yesterday found me at 5 p.m. scratching my head and wondering once again what to feed the nits for dinner. I had a brainstorm. One of my hardy perennials is lentils over rice: A can of Progresso Lentil soup thrown over basmati rice. My kids love it. But I didn't have any Progresso lentil soup. It's gotten hard to find, for some reason. My friend Joey and I exchange hot tips on where to find it around town ("They've got it at Smart N' Final! Get over here!"). Tony lucked into three cans of the stuff on a shopping trip to Von's lately, and cleverly bought them all. Alas, I went through it. 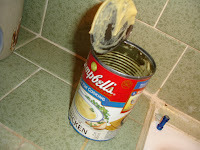 What I did have, however, was a can of Campbell's cream of chicken soup. What if I made that and threw it over rice? Wouldn't it be sort of a creamy, Lebanese-style chicken and rice sorta thing? So I open the can, taking great care to ignore the 2003 "best by" date on the bottom of the can. It's canned, right? It's all preservatives. And everyone knows Campbell's soups have enough sodium to pickle a small mammal. It'll be fine. Indeed, I shake the cylinder-shaped mass of...chickenish stuff into the saucepan, where it lolls horrifically. Thank God the kids are in the other room because this is like making sausage: You really don't want to see what goes into it. I am still operating under the delusion that they will find this dish palatable enough for me to include it on the regular weekday menu, and yet I'm still cogent enough to know that one glimpse of what currently quivers in my saucepan would put them off of anything I make them forever. I use one half cup water and one half cup milk to cook the stuff up and make it really creamy. Ah! Cream of chicken soup! Nice ocher color. I ladle some over a nice bowl of fragrant Basmatti rice and mix it in. I try it. It's good! Warm! Filling! I put two bowls out for the kids, plus a little dish of carrots. They run into the kitchen. They're starving, they say. Then they stop short when they see what's on the table. "What's that?" asks the boy. "Rice with chicken sauce," I say, wishing I could think of a more enticing name. My own working title for this dish is rice with chicken crap, but I keep that to myself for now. He looks at me like I'm Andrea Yates. "It looks gross," he says. "It tastes great," I counter. "I'm not gonna taste it," he says. "You have to at least taste it before you can tell me you don't like it." He looks at me. I look at him. I see what's happening. So as the Mother, the custodial parent and number one authority, I play the best card I have. "I'll give you a dollar if you take a bite," I say, thinking that surely once he tastes the concoction of starch and chicken sauce, he'll love it, and fill his belly. "Show me the dollar." Where's a six-year-old getting this kind of mercenary talk? I show him the dollar. He takes a bite. Then puts out his hand. He does not take another bite. He focuses his attention instead on the carrots and his glass of milk. I'm forced to bribe his older sister, too. She takes three bites before pushing the bowl away. I end up eating the better part of their bowls myself, because I'm starving and I, at least, find rice with chicken crap comforting. I wait all night for them to tell me they're hungry, but they don't. Maybe they're afraid I'll cook something new for them again. LOL!! You're so funny! I was cracking up all through that post!